I love the addition of thyme here, and what’s better than an awesome slow cooker meal? NOTHING. Nothing. 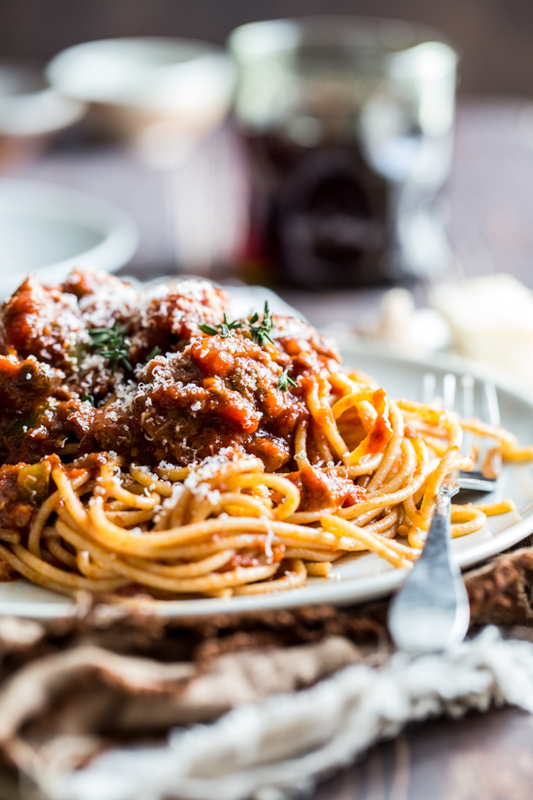 Such a cozy, comforting dish perfect for any day of the week! This looks wonderful! 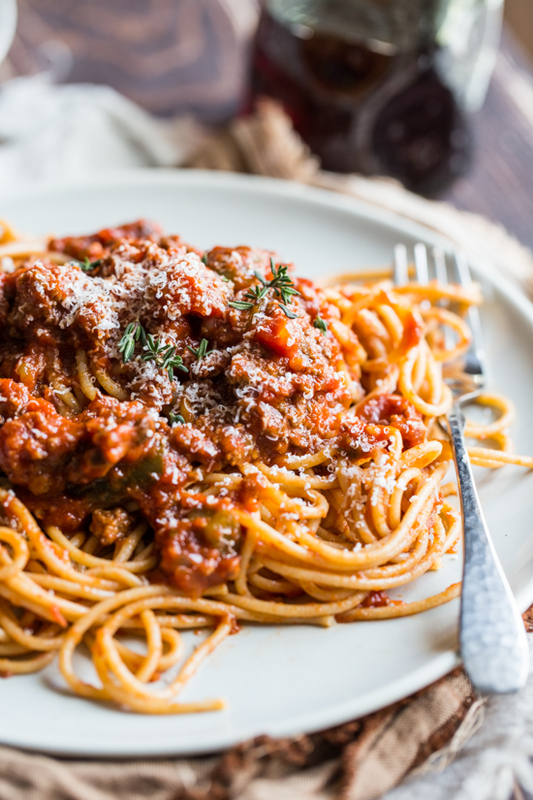 I would never have thought of doing meat sauce in the slow cooker, what a good idea. Wowza! This looks amazing. I really love the look and feel of your blog and the way you style your food photos. Such a good vibe going on here! I found your blog through the Mixed Conference attendee list. I’m happy to make this connection and excited to meet you in person next weekend! If I don’t eat pork can I substitute it for something else? Sounds like a great recipe. Hi Louise! Yes, I add the sausage because it is already seasoned and adds great flavor to the sauce. You could substitute turkey or chicken Italian sausage if you would prefer. I’ve never made it that way, but I would think that would work well. 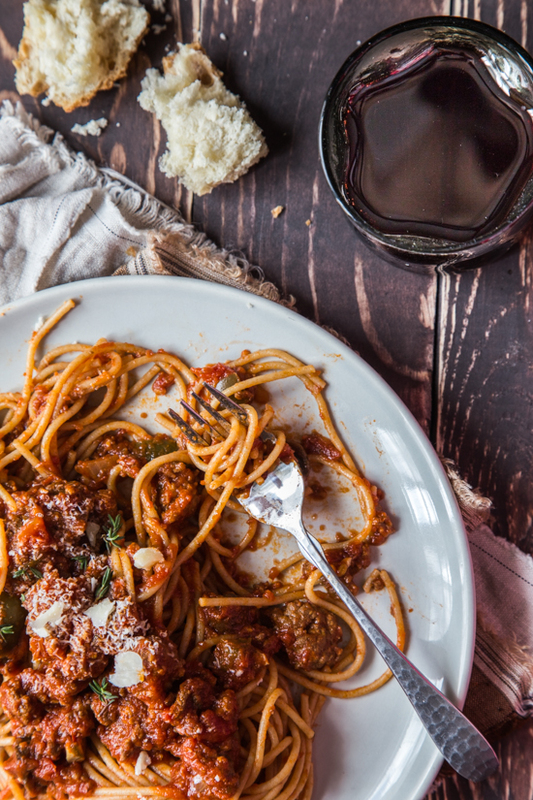 That plate of pasta has my name written all over it—definitely one of my all time favorite meals. I don’t have a slow cooker, but will for sure be making anyway! Hi! Found this through Pinterest. Was wondering…what size can of tomato paste? Looks yummy – can’t wait to try it! Thanks! Hi Tiffani! I used a 6oz can of tomato paste for this. I hope that helps, thank you so much for stopping by!! Thank you for the lovely recipe. Have a Wonderful Weekend! This looks so good! I wondered about the parmesan rind…isn’t that wax? Why do you add it? The rind of true parmesan is actually just the result of the cheese being brined and dried, therefore protecting the rest of the cheese. It is actually edible, although because of it’s hard nature, most of the time people don’t eat it. However, when added to soups and sauces it can impart fabulous flavor that is like no other. So don’t be worried! It’s not wax 🙂 Enjoy! Just saw your recipe, sounds good, but, I was wondering if it could be made without the parmesan rind?. Mostly because I doubt that I could even find it where I live and also I cook for myself only so, I’d never use up all the parmesan before it went moldy. Hi Steve, absolutely! I would just replace it with a bit of grated parmesan, or just leave it out all together. Thanks for stopping by! I just happened to stumble upon this recipe one night and decided to make it for dinner the next day. THANK YOU!! The recipe was a hit. My kids loved and so did I. I didn’t get a chance to make it with the parmesan rind bcz I couldn’t find it in town but I’ll keep trying. Recipe is amazing!